The Elephant Springs is about 40km south of Hue City, located in Phu Loc District. Small and large stones look like the elephants playing in the middle of the cool streams. Why Elephant Springs (Suoi Voi) is special ? Small and large stones look like the elephants playing in the middle of the cool streams. Especially, a big elephant stone lies next to the waterfall, a stream of water sprayed continuously from its hose, making anyone interesting. At that time, you can imagine that you are standing in the middle of a forest with many rare animals. Elephant Springs is about 500m long including 2 different areas. Here, visitors can swim and soak in cool water or sat on the flat rocks and breathe fresh air, or listen to the sound of the water pouring, the wind flowing, the birds singing, or stroll among the green trees. In addition, the visitors can hang on to the roots of trees and swing yourself on it to find the thrills. The road to ElephantSprings is very convenient for the tourists. This place is not only meeting the tourism demand of Hue people at the weekend but also is very attractive for many tourists when visiting Hue ancient capital. What to explore at Elephant Springs (Suoi Voi)? 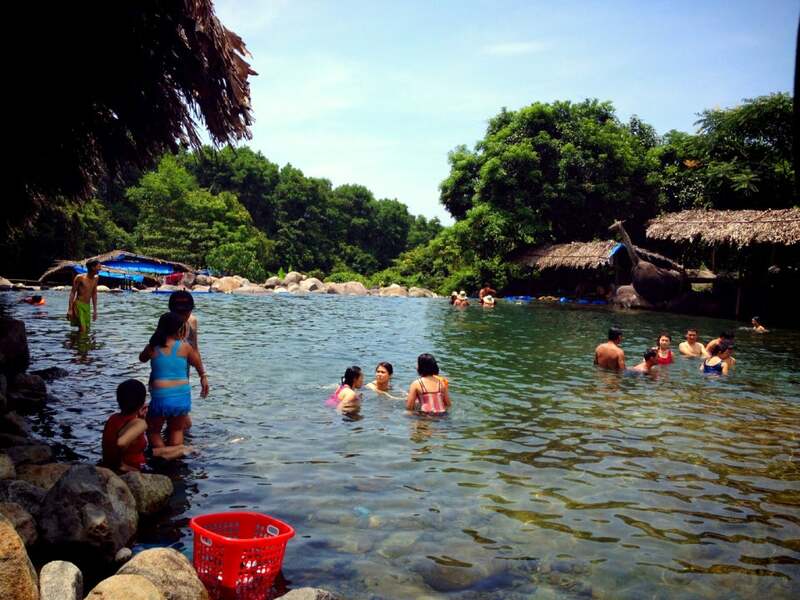 The area consists of a number of natural pools with clear and cool water, scattered by huge boulders. With some imagination, you can find a boulder, which looks like an elephant head, giving the name of the springs. 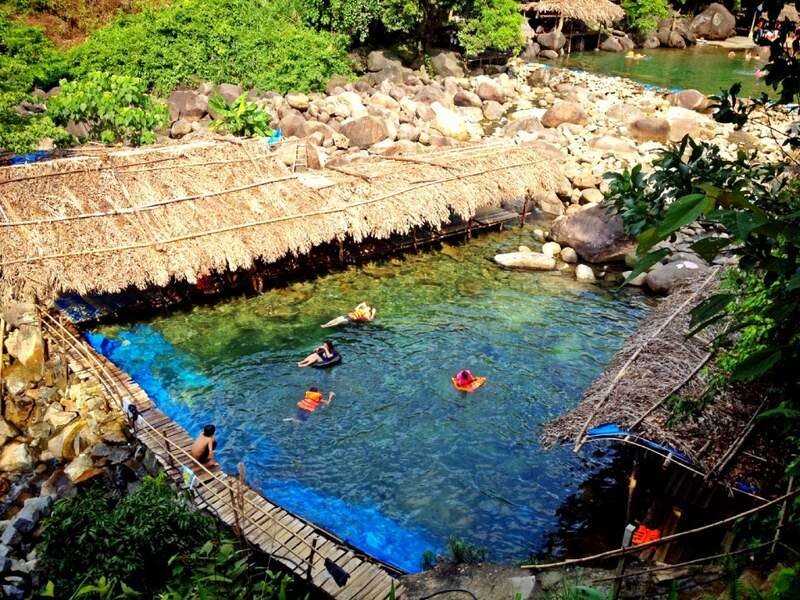 Climbing on the boulders and swimming in the springs or just relax on some sitting mats, offered by the locals, can give you opportunities to spend several hours visiting this lovely, still-undiscovered area. How to get to Elephant Springs (Suoi Voi)? Take Highway One south out of Hue, and keep an eye on the mile markers along the road. When you get to the one that says Danang 52km you're there (coming from the other direction, it says P.Bai 44km). Take a right and follow the road across the stream to the springs (resist taking a left across the big bridge -- go straight and the road veers left over the stream) Admission is free, plus 5,000 VND to park your motorbike. 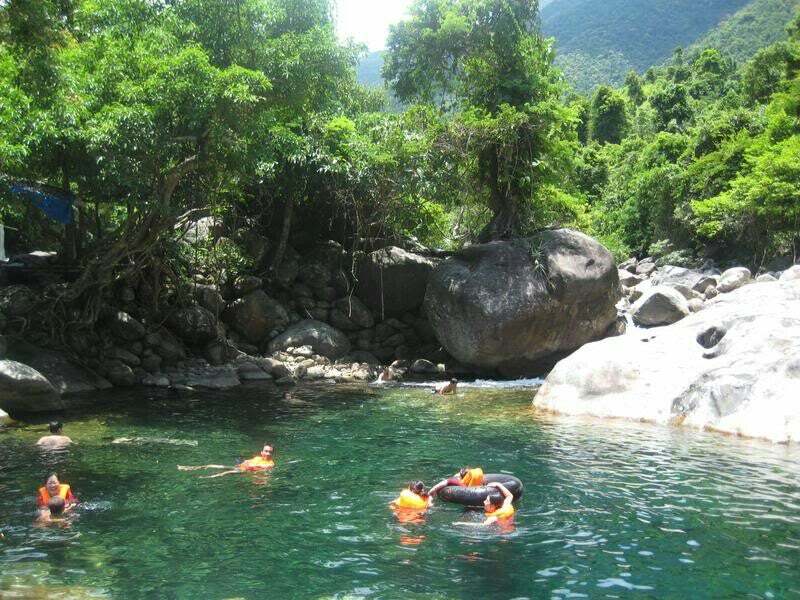 Just follow the road through the countryside of Bach Ma National Park until you arrive at the entrance of Suoi Voi, buy a ticket (should be 12.000 VND) and continue the road to the main parking. They also do BBQ chicken dinners for you while you relax and enjoy the cool clear water. There are plenty of bamboo-floored, open-air restaurants lining the springs that can cater to you. You should bring your camera to caught the fascinating view of the nice place. The first lake of the Suoi Voi spring is quite wide and deep but can be busy. If you are looking for more privacy you just follow the river upstream until you find a good spot. The last little lake gives a good chance for a quite place considering a 15 minutes climb to the top. You should bring suntan, hats, jackets, rain coats and mosquito repellent. You should bring some clothes to change after swimming time. Kids should be accompanied by adults. It is located at Tien Loc, Phu Loc, Hue 954 Vietnam.